The Pauls legacy in Hamilton real estate all started in the 1950's with Frank Pauls. It wasn't long after Frank started selling real estate that he opened his own brokerage, Frank Pauls Real Estate. He opened the doors to his new brokerage on Septmeber 6, 1962. In 1967 Frank Pauls was elected as the president of the Hamilton Real Estate board. Frank had a very successful Real Estate career. Not only was he successful at selling Real Estate, he was a sought after motivational speaker; helping other Realtors learn how to sustain a career. Frank sold Real Estate in the Hamilton area for many years. In 1971 he was joined by his son, Jim Pauls. Jim started his career working at, Frank Pauls Real Estate. Over the past 40+ years Jim has owned his own brokerages and also worked for some branded companies. Jim had a consistent award winning sale production. Jim has also been a mentor to many local Realtors in the Hamilton area. In the early 2000's when Susan joined Jim they decided to open Jim Pauls Real Estate Ltd, using Frank's original logo as their own. A thick, healthy lawn is a lot more than nice-looking green space. Well-maintained turf contributes to a deeper root structure that helps your lawn withstand the extreme heat and cold of our Canadian climate, cools our atmosphere and reduces erosion. All living things need food for optimal health, including plants and grass. A healthier lawn will provide benefits for your home, including the trapping of airborne dust and other pollutants for cleaner air. In fact, a 50 by 50 foot lawn produces enough oxygen every day for a family of four. It’s important to use the right fertilizer for your type of lawn, so always read the bag for information that includes the amount of nutrients, such as the NPK, which stands for nitrogen, phosphorous and potassium. The bag will also tell you how much area it will cover and how to apply it properly. Newly established lawns require phosphorous for root growth. Older lawns that have had the clippings left on after cutting gain nutrients back as the clippings decompose. Established lawns can usually use a phosphorous-free formula. 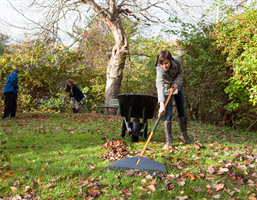 Fall is one of the most important times to feed your lawn to provide nutrition that will help see your lawn through the long winter. If you have leftover fertilizer from last season, you can still use it. Break up any clumps before placing it in the spreader, and store any remaining fertilizer in the original package, sealed and in a cool dry place. Find more information to produce the healthiest lawn online at greenerworld.ca. When it comes to decorating your home, it’s a smart idea to put your time, energy and money into the elements that make a difference to beauty and comfort. And don’t forget the window treatments. 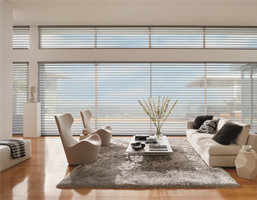 An essential element in any space, window coverings manage illumination, privacy and even energy efficiency. They set the tone and ambiance; create a finished, polished look; and, can be a gorgeous design element that draws the eye. With more time indoors on your hands thanks to cooler weather, you finally resolve to refinish that forgotten wooden chair that’s been tucked away in the garage all summer. Whether you’re only giving the chair a fresh coat of paint or refinishing it from scratch, be sure to protect yourself and those around you in the process. Keep these tips in mind before beginning a new refinishing project. Use a chemical paint stripper. Ideally, choose one with a paste that can be applied with a brush. Paint strippers contain substances that may be harmful, so use them carefully. Always wear safety glasses, gloves, and a good-quality breathing mask. The label will provide more detailed information on personal safety equipment you should use. This is essential to protect you and your family. 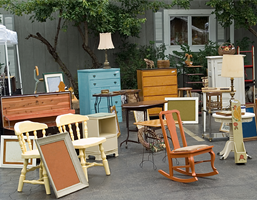 Dispose of refinishing waste materials properly. It can be dangerous to throw away rags and certain other materials that have been used for refinishing furniture. Aside from potentially starting a fire, they can also cause serious damage to the environment. Although some of us may be hanging on to warmer temperatures, it’s inevitable that cooler weather is on its way. 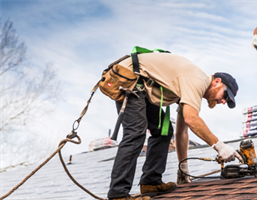 With the change in seasons comes a change in home maintenance that’s needed to prepare for the cooler climate. So, get ahead on your chores while the sun is still shining and follow these four simple tips to stay on track. Clean out your gutter and downspout. 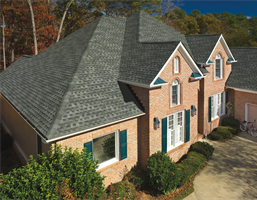 Once leaves begin to fall, they will fill your gutter and downspouts blocking water that is draining off your roof. 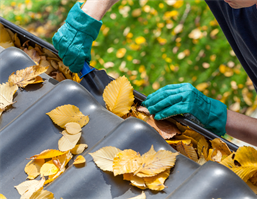 While this step may need to be repeated more than others, cleaning out your gutter regularly until all leaves have fallen will benefit your home long term. If you come across little friends nesting, safely remove them to avoid them calling your attic their new home. Check your windows and doors. With cool, breezy air upon us, it’s important to check windows, doors and cracks that need to be fixed. Feel around for any drafts that may be coming through and try caulking around these areas to repair any broken seal. Not only will this keep you warm, it will reduce energy use and save money on your heating bill. Inspect your furnace. Hire a professional to inspect your furnace before the cold weather arrives. Since the heat has been turned off for months, it’s important to complete a general maintenance to ensure your furnace is ready for another winter. Remember to clean out your filters regularly and replace as needed; this will benefit the air quality in your home and keep your furnace running efficiently. Make the switch to winter tires. It’s important to make the switch from all-seasons to winter tires so that your vehicle is prepared for winter driving conditions. Even before the first snowfall, the drop in temperature requires a different type of tire to grip the road. Winter tires should be replaced every two to three seasons. If you have old tires that are no longer in use, drop off up to four for free at a registered Ontario Tire Stewardship collector. Recycling used tires helps keep the circular economy rolling by turning your old treads into sustainable products manufactured in Ontario.